Built in the middle of the desert, Las Vegas has always been an epitome of glamour mixed with easy money and lots of shady business. This gambling metropolis offers people hope that their life will change the second they step on the Las Vegas Strip. The hope that a life-changing miracle is just one slot spin or one poker hand away attracts millions of people to Las Vegas every year. Let’s see how it all started. The city of Las Vegas was founded around 1911, at the same time the railroad that connects this part of the USA with the Pacific was constructed. Talk about the right timing, the state of Nevada banned gambling just a year prior to that. However, Las Vegas still became a haven for gamblers all across the country, even though it all started off in illegal underground establishments. The construction of the famous Hoover Dam in 1931, another must-see tourist attraction in Nevada, brought numerous workers to the area desperate for some fun and relaxation after a hard day’s work. They found all they wanted in Las Vegas, where the first casinos and showgirls joints opened to make all their dreams come true. From that point on, the things only further escalated, painting the picture of Vegas we know and love today. Except that the dam workers left and criminals came. Many gangsters took advantage of the fact that gambling in Nevada became legal again in 1931 and started using casinos as a cover for money laundering and other dirty businesses. The 40s were the years when criminals ruled this city. Bugsy Siegel opened the legendary Flamingo resort and casino in 1946, and many other mobsters followed his example. Consequently, many of the most iconic Vegas landmarks started mushrooming soon after. Another turning point in the history of this vibrant city happened in 1967 when a wacky billionaire Howard Hughes moved in a Dessert Inn penthouse and decided to buy the hotel. He only wanted to make sure no one can throw him out. This was the moment when the corporate replaced criminal money in Las Vegas. Moreover, another wealthy casino owner, Steve Wynn, opened the most ravishing monumental hotel and casino Mirage. 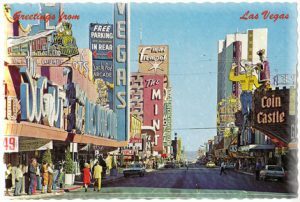 Even though the old Nevada casinos were destroyed, more modern, huge complexes offering gambling and other spectacular forms of entertainment soon took their place. The aesthetics remained the same. Lavish, glitzy replicas of the most famous international landmarks stand side by side offering their visitors a once-in-a-lifetime experience. Today, Las Vegas is one of the most attractive and most visited Nevada gambling cities and tourist sites in the world, with almost 43 million visitors in 2016 who spent an incredible amount of $35.5 billion. The everlasting appeal of Las Vegas and its hotels and casinos with a promise that everything is allowed since “What happens in Vegas, stays in Vegas” will keep this gambling capital of the world high on everyone’s must-visit list for a long time. These are a few of the monumental Las Vegas establishments that offer so much more besides gambling to their lucky visitors. If you find yourself at one of these places, you will be able to try out every casino game imaginable. These top Vegas casinos have the richest offer of slot machines and different poker rooms, but you can find all other gambler favorites here like Craps, Blackjack, or Video Poker too. There is also a possibility of placing a bet on a horse race or a football game in one of the many sportsbooks out there. The goal of these luxurious resorts is to indulge their visitors in every way so that they wish never to have to leave. Moreover, you can also relax in a spa or pick one of the numerous restaurants with international cuisine. And if you just need to relax after a wild night, there is a spot at one of the many pools waiting for you. In a nutshell, people at these places will do their best to make you feel like you are the ruler of the world. The whole concept of these luxurious hotels and casinos is devised to discourage visitors from leaving their premises. Many people who have visited Vegas got caught in a vicious circle of lying at the pool all day and gambling in casinos at night. And once their holiday ended, they’d suddenly realize that they didn’t even set foot outside the resort. 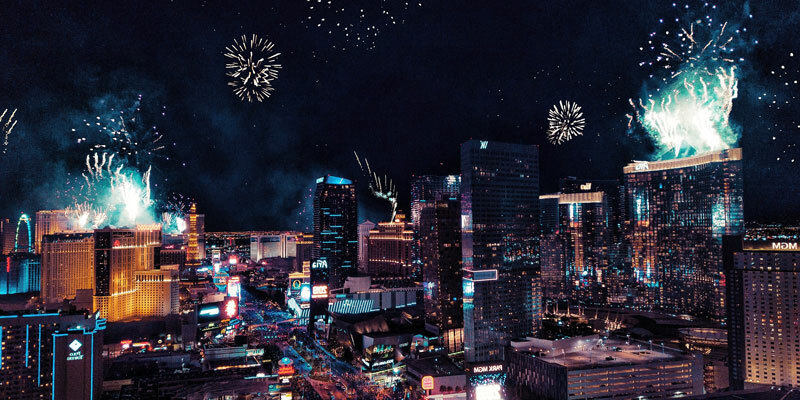 But if you want to escape gambling and carry home some different experiences and memories, here are some interesting destinations that you should check out when in Vegas. This is a famous tourist spot that people come to see and hear about, and of course, take some pictures of. What is more, you can also walk across it. And while you’re there, you should definitely spend some time on the Lake Mead, a lake that Hoover Dam made. There, you can enjoy the peace and quiet that water brings. This is another natural beauty ideal for all who like to spend their time outdoors. You don’t need to get too far from Vegas to spend a great day hiking or riding a bicycle in the fresh air. So if you are all into keeping fit, this would be a perfect spot for you. If you are not so keen on nature, numerous other attractions are just waiting for you to discover them. 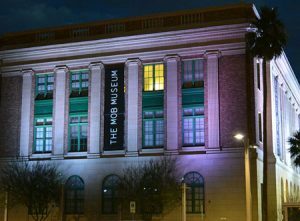 Mob Museum is certainly one of them because this is a unique place dedicated to the history of crime in the USA. There, you can find many different presentations describing the crucial events that marked the life of organized crime and the states’ attempts to fight it. These presentations are backed up with more than 200 artifacts. So if you love that period and the theme, a visit to this museum is a must. This is another place designed to bring important events from American history closer to the public. There was a short period of total bliss after the end of WWII. Soon after, the tensions between the USA and the USSR escalated into the Cold War. During this period, both nations prepared themselves for a nuclear war. Thus, America began nuclear weapons testing in Nevada. This museum contains more than 16000 exhibits related to this period. So if you are interested in the Cold War era and want to find out more about nuclear radiation and similar things, put this museum on your list. If you want to clear your head after a gambling marathon, you should definitely check out this oasis of natural beauty and serenity. Whether you want to get lost in one of the mazes or simply take a break in a gazebo, you will be blown away by the abundance of different shapes and colors only nature can create. This fabulous garden is a part of the Bellagio Resort complex and is the feature that welcomes numerous guests — it is placed right across the check-in desk. You can’t say you’ve been in Las Vegas unless you’ve taken a walk down this famous street. Settled in the downtown Las Vegas, it is not as high-end as the Strip, but it is equally flashy. If you are in Vegas and you adore the Mardi Gras vibe and cheap thrills, Freemont Street is the place to go. Filled with shabby casinos that have seen better days and shady bars offering cheap entertainment, Freemont is perfect for those who enjoy roaming the streets and getting first-hand impressions. If you’ve ever wondered where all those wedding chapels offering instant weddings are, the answer would be Freemont Street. There is also a fun piece of trivia related to those chapels — it seems that people originally came there to get a quick divorce and not a quick wedding. This was a common practice in the forties and the fifties. Even though Las Vegas is the gambling center where the majority of Nevada casinos are located, there are also other Nevada gambling cities where you can go to play your favorite casino games.. When you think of gambling in the USA, this town located near the Lake Tahoe comes to mind right after Las Vegas. Reno had also started blooming when the railroad came. They also grabbed the opportunity to profit from gambling once it became legal again in 1931. Those who prefer Reno to Las Vegas claim that the atmosphere there is more relaxed and friendly, as well as that those casinos remind gamblers of the “old Vegas,” when everything was much more casual. This city, thanks to a favorable location, can offer so much more than gambling to tourists, like perfect spots for fishing or camping, rafting, or hiking. There are about twenty casino resorts in Reno you can enjoy playing your favorite games in. And when you get tired of gambling, there are plenty of other things you can do, or you can just enjoy the scenery. Reno is not as luxurious and expensive as Las Vegas, but it offers a bunch of fun activities for the entire family. That’s why it is often called the biggest little city in the world. Even though the majority of tourists would rush to Las Vegas first, there are some other Nevada gambling cities we recommend you to visit while you are there. You definitely shouldn’t miss out a gambling session in North Las Vegas. This place can also offer outstanding casinos and hotels to visitors. The perfect example of a venue that fulfills all your wishes is the Aliante Station Casino. There, you can find an excellent selection of various casino games ranging from table games and slots to sports betting. Furthermore, you can also relax in a spa, watch a film in their movie theater, or enjoy some of their other amazing services they have to offer. 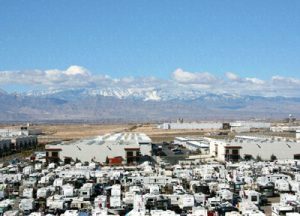 This is another one of the Nevada gambling cities located a hundred miles away from Vegas. There are numerous luxury resorts offering top hotels and casinos to their visitors. So if you want to take your minds off gambling, you can relax in a spa or on one of the golf courses. In addition, most of these venues are also perfect for conventions. The high-end resort you can find all these amazing services in is called Aquarius Casino Resort. You should look it up if you are visiting Nevada. We know that the first association to Nevada is gambling, but this article shows that you can do much more than go to a casino when visiting Nevada. Nevada is a state with a rich history, dating as early as the Gold Rush era. With the invention of the railroad, the entire area bloomed, and the first gambling venues opened up and started making money. And once the Nevada state legalized gambling, the gambling business immediately began flourishing, making Las Vegas the gambling capital of the world. Finally, we hope you’ve now learned that there are also numerous other Nevada casinos besides Las Vegas where you can gamble at.In addition we have offered you numerous other things to do in Nevada besides gambling. Ultimately, I hope that you’ll find all this info useful if you ever decide to plan a fun tour of different Nevada casinos.